Why run 1953's letter from Al Chop to Maj. Donald Keyhoe's publisher again (and a better copy), having featured it two or three times before? First, because I cherish this particular triumph of correspondence from the days when letters were letters, destined to survive on paper indefinitely. How long would this document have lasted as an e-mail? As a jpg image? If converted from rich text into lackluster plain text, minus the official look, what might have been its fate? And no official seal? Please! Like a day without sunshine, to quote a TV commercial. I've even thought of starting another blog with one eternal entry displaying this letter and nothing more, not ever. In fact, were it in my power, I think I'd instruct every TV station in the country that still runs the National Anthem before signing off for the night to show Al Chop's letter prominently prior to a hitting the goodnight switch. I don't know, maybe a sober viewing should be a requirement for every high school American history class in the U.S. As readers of my blog regarding the 1956 movie, "UFO" know (see link), I've posted several personal letters from the late Mr. Chop over there, but this timeworn document trumps every piece of mail in my files just for the last paragraph's stand-alone shock effect from a man of integrity who was just trying to do his job. Albert M. Chop, chief of the Pentagon's Air Force press desk, did far more than type out a letter to Henry Holt & Co., a major U.S. publisher -- he put a time line on history itself. Barely six months before churning out this testimonial to Keyhoe's UFO work, Chop had endured a very busy ringside seat and public relations tightrope amidst two bouts of apparent UFO activity high over the nation's Capitol, occurring within just a week of one another in 1952. In addition to the nightmarish days and nights which followed him to and from the Air Force press desk, Chop was already so impressed by a wealth of good military and airline UFO encounters that he slowly transformed from UFO skeptic to ardent proponent. Keep in mind, Al was an ex-Marine with a dual reputation as a responsible journalist, unlikely to radically alter his views without just cause. So -- Mr. Chop answered a letter from Henry Holt & Co., responding in a remarkably freestyle manner regarding the possible origin of UFOs. Hard to believe, but up to that time a fellow working for the government could openly speculate a bit on things like this. Yes, he took a little -- a little -- flack from superiors over this because Al never suspected (though he should have) that the publicity folks at Henry Holt would take rabid advantage of a delicious opportunity to post the letter on the back of Keyhoe's new book jacket for the whole country to see and purchase (for some reason, as we've mentioned on a previous occasion, the British version did not include Chop's letter on the jacket). Flying Saucers From Outer Space was Keyhoe's title for this 1953 release, and now it seemed to project a profitable aura of official sanctioning about it, even if it didn't. Good. So what? But, as I said, Chop accomplished not simply a letter, but an historic time line, an indelible stamp, on January 26, 1953, for this was the year when the "Robertson Panel" convened. 1953 was also the year that aeronautical engineer Capt. Ed Ruppelt departed Project Blue Book and the Air Force, only to die of a heart attack a few years later, still a relatively young man. Al left government service that year, too, for a while, but the reason, far from being job-related, was the simple fact that his beloved wife, Dee, hated crowded Washington and yearned for the open spaces. So they up and moved West, Al went to work for Douglas Aircraft Co. and eventually rejoined the government payroll, first at NASA (sometimes as the voice of mission control during a space launch) and then with the Atomic Energy Commission. Al's letter pretty much delineates the end of an era, a period when citizens could depend somewhat upon openness in government. The CIA, H.P. Robertson and the gang were concerned about UFO reports messing up intelligence channels integral to national security, so everybody went nuts and decided to downplay UFOs from that point forward. Maybe it was a good idea at the time, but -- but look where we are today. The policy never went away and things just became worse. Any, any -- any government public information official daring to write a letter like that on official paper tomorrow would be nailed faster than you can say yes-we-can. Way back in this blog, I posed a question or two about heroes, contemplating who they are and what makes them heroes. While many are obvious, too many more are not. Is it heroic, for instance, for ex-military personnel to come forward and alert the public that those UFOs which governments so stringently deny are actually, from their own perspective and observation, intelligently controlled objects sired by amazing sources unknown, even when such admissions may questionably violate security oaths they took years ago? Make no mistake, Chop echoed the UFO opinions of many in the government, though being far too modest and careful to specify more than "some of the personnel" in his letter, at this time when freedom of official speech glowed refreshingly tangible in specific instances. "Some of the personnel," hardly a reference to office folks standing around a water cooler, meant high-ranking military people, engineers and scientists, and there were many standing silently on Chop's side of the philosophical aisle. Contrast the early fifties with the current day, when former military officers such as Robert Salas and Charles Halt come forward, probably at considerable risk to themselves, to alert us of incidents which open governments are charged with telling us about, but won't. Yet, the numbers of former military UFO whistle blowers appear to be on a steady increase (per especially the research and writings of Robert Hastings and revelations from the Bentwaters RAF base/Rendlesham Forest witnesses). Who are our modern heroes? Who are the new patriots -- or is there a "new?" Funny, isn't it? In Chop's time, everybody recognized the enemy. Now, nebulous forces and agents of regulation consider us our own worst enemy, and telling the truth is, presumably, a punishable offense, as supposed national security entities wait vigilantly to wield a destructive club in strange ways against their own. Our own. Oh, absolutely yes, how I honor Al Chop's truthful, lay-it-on-the-line letter to Henry Holt & Co., truly bold and tragically emblematic for the end of an era. "I wish to make it perfectly clear that the UFOs that I saw were structured machines moving under intelligent control and operating beyond the realm of anything I have ever seen before or since. 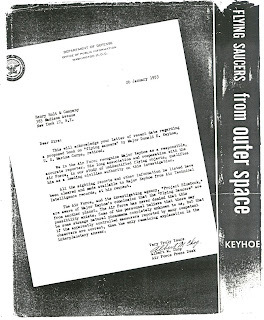 I believe the objects that I saw at close quarter were extraterrestrial in origin and that the security services of both the United States and England were and have been complicit in trying to subvert the significance of what occurred at Rendlesham by use of well-practiced methods of disinformation." -- Lt. Col. Charles Halt, USAF, Ret., former Deputy Base Commander at RAF Bentwaters (from his statement in a press release of June 25, 2009, issued via British UFO researcher and former UK military member Gary Heseltine who, with Halt and other military personnel, experienced something incredible and UFO-related in December of 1980). The Rendlesham Forest UFO incident was briefly mentioned in my previous entry, but I really shouldn't let it go without offering a very important update, and its substance may be read in the above quote. In little more than a year, the UFO research community will note the 30th anniversary of England's Rendlesham Forest UFO incident (several of them, actually), and Halt's admission was clarified as noted this year because a possible motion picture script is in the works, and he decided to make his already unwavering position clear in no uncertain terms. Though many readers are already familiar with her Web site, I do suggest a worthwhile journey to Linda Moulton Howe's Earthfiles at www.earthfiles.com where Ms. Howe has posted a multi-part, illustrated section regarding the fascinating Rendlesham story. I shamelessly admit borrowing Lt. Col. Halt's quote directly from her site today. During my four U.S. Air Force years as a medical specialist (1968-72) in two hospitals -- and particularly at a pilot training base populated by numerous veteran military pilots and other flight personnel -- I often wished I could just put up a sign requesting information from those familiar with UFO incidents. However, (1) I'm sure there were many, but they all would have kept their mouths shut for fear of ruined careers or ridicule at that sensitive time, and (2) can you imagine how quickly I would have been punished and flown away to serve out my time at a medical clinic somewhere in near-desolation? But there we have it in December of 1980 -- U.S. and British Air Force personnel experiencing shared military UFO encounters with startling implications. If we believe the story slowly unraveling over the years, more than one installation picked up UFOs on radar, probable nuclear-equipped missiles may have been compromised by ground-invading beams of powerful laser-like light, photos were taken and confiscated, the government cover-up began early on and -- allegedly explicit telepathic contact with UFO entities occurred. Further, for some witnesses there was noted an electrostatic effect to the air itself, causing their hair to stand on end, while time itself seemed to slow down as they approached (and, per one witness, actually touched) an object perched on or just above the forest floor. This particular facet of the Rendlesham case reminds me of a young woman's oral testimony regarding another British Air Force base UFO incident, where a large object flew at treetop level overhead and people underneath were unable to produce sound while speaking, as the UFO seemed somehow to distort its immediate environment (ref. a recording from Wendy Connors' vast Faded Discs audio collection which I reviewed a few years ago for the UFO Updates Web site). You can read all about these allegations in Ms. Howe's excellent accounts and at Web sites dedicated to the Bentwaters/Rendlesham case, but before I sign off on this today I wish to raise just one caveat. Assuming that hypnosis sessions, conducted with an airman who claimed to have actually touched a landed UFO and received instant thoughts from "them" regarding their identity, reflect what actually happened (and he wasn't alone in believing telepathic communication occurred), beware. If, as is reported, "they" claim to be our own time-traveling species from 40,000 or 50,000 years in the future, I would tend to put as much instant faith in the veracity of that assertion as an expectation that NASA's moon rocks will sprout wings and fly off to Jupiter tomorrow. I say this simply because, looking at all the alleged UFO entity encounters painstakingly documented by researchers internationally over the decades, if there is one thing upon which we may agree it's the likelihood that we're being fed lies. UFO entities' alleged revelations and wild promises seldom come true and, worse, often make little sense. Some researchers rightfully suspect motivations among supposed visiting UFO occupants intended not to inform us but, indeed, to throw us off the path of truth. The widely surmised reasons about why is the issue that should concern us as deeply as the apparently spoon-fed government misinformation entwined in the Rendlesham case. So be careful. While most forests are thick with flies, Rendlesham may have been thick with lies, lies of the cover-up variety issued from multiple directions, and they seem to have attacked competent military personnel mercilessly in subtle ways.